RCT, also known as endodontic therapy, refers to the removal of the pulp tissue from within the very core of a tooth - dying, dead, or infected tissue inside the small pulp space. The dental pulp may be the source of irritation which can cause so much tooth or jaw pain and infection. Once all the pulp tissue or infection has been cleaned out and the canal spaces have been shaped, enlarged, and disinfected, then the empty space is filled in with an inert substance such as gutta percha (a natural form of tree rubber) and root canal sealer cement. Ultimately, the top (crown) of the tooth would need to be repaired in an appropriate manner as to protect what tooth structure remains. Why Would a Tooth Need RCT ? a tooth has broken, and there is very little original tooth structure left to build upon - in this case, RCT is elective because the canal space is needed in order to attach a post and core build-up. Most teeth can be treated. Occasionally, a tooth can't be saved because the root canals are not accessible (calcified pulp space), the root is severely fractured, the tooth doesn't have adequate bone support, or the tooth cannot be restored. 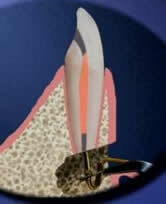 However, advances in endodontics are making it possible to save teeth that even a few years ago would have been lost. 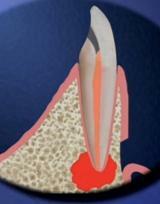 When endodontic treatment alone is not effective, additional endodontic surgery may be able to save the tooth. How Does the Pulp Die or Become Abcessed ? 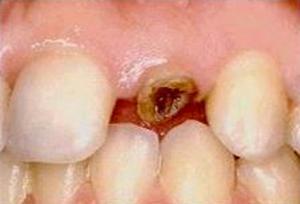 What Are the Choices For a Tooth If a Pulp Is Degenerating, Dead, or Abcessed ? How Long Does RCT Take, and What Will I Feel After ? Length of treatment varies according to the type of tooth, the degree of infection and the skill and efficiency of the Dental professional. RCT may be done by either a General Dentist or an Endodontist ( a Specialist, who has taken extensive training in the field). Teeth in the front mostly have one root canal to treat, while teeth in the back may have three or four to be treated within the actual tooth. Teeth that have a great deal of infection in or around the root are often treated in two separate visits: the first, to remove the internal source of the infection (and allow for the person's immune system to clear up some of the abcess), and a second visit to complete the cleaning/shaping/filling of the root canal system. Between visits, a temporary filling is put into the tooth to keep the canal system free of contamination from the bacteria in the mouth. 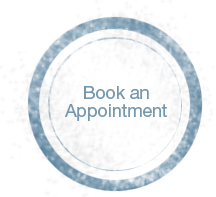 Otherwise, it is usually best to have the whole RCT done in one visit - usually an appointment of 1 to 3 hours. Regardless of the type of tooth being treated, there are three stages or steps that are always performed: access opening, cleaning & shaping, and obturation (canal packed with rubber and cement sealer). RCT must always be done in a clean and dry field, so a rubber dam will be placed over the tooth to be treated, blocking any oral fluid from the mouth (containing bacteria) from getting inside the tooth while it is open. The sensations you may feel after RCT is determined by several factors. There seems to be a correlation between the amount of pain before treatment and after. Often there is minimal discomfort for a few days after treatment. However, an increase in discomfort may occur over two or three days, and persist for two or three days. This is considered normal, and is a function of how the body's immune response protects it from foreign materials and the local inflammation produced by the mechanics of the root canal procedure. It is always important to take any medications exactly as prescribed by the Dentist. They go a long way in helping you to feel better and heal faster. 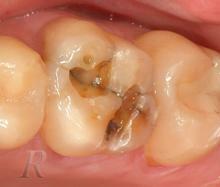 What Is Done to the Tooth After RCT ? 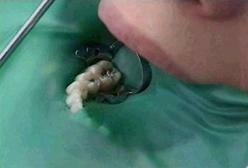 The tooth must now be rebuilt to replace the tooth structure that has been lost by fracture, decay, and access opening. Most often, the remaining tooth structure is thin and weak. The canal of the tooth may be used to hold a post, which helps secure new filling (core) material to the walls of the tooth. It is usually recommended that the tooth then have a crown in order to protect the entire post, core, and tooth from further breakdown. 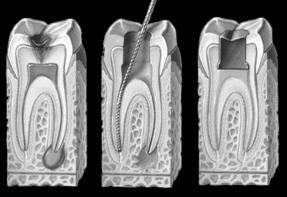 Are Root Canal Treatments Always Successful? Why Not ? RCT for a particular tooth may be considered a success if it has led to reduced pain, swelling, or infection as judged by the patient. As well, if there has been identification of an abcess under the root of the tooth on x-ray films, then we should expect to see evidence of healing over time in the form of bone regrowth. RCT eliminates the disease within the tooth, but it is up to the patient's immune system to be able to clean up and heal in the bone around the tooth. Generally, RCT has a high success rate of approximately 90%. Besides the lack of healing due to one's own biological limits, there are other reasons that may contribute to a failed RCT. Sometimes, the Dentist is unable to work all the way down to the very end of a root canal due to a blockage or a severe curve of the root - this means that some irritants like bacteria potentially remain at the very end of the root. As well, it is possible for the delicate root canal instruments to break or separate during the procedure and remain stuck inside the root - sometimes the fragment can be removed or bypassed, and the case completed, but other times not. Again, the inability to bypass a file fragment may leave irritants in the deeper part of a root. What are my options if a root canal treatment fails? The answer really depends on the history of the tooth in question. Sometimes re-doing the root canal (by a different Dentist) can yield a better result. For example, it is possible for a Dentist to be miss a canal during the course of treatment, as there are easy cases and more challenging cases. 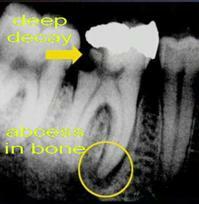 It is usually the Endodontists (root canal specialists) that are best suited to attempt the re-treatment cases. One other option is just to accept the fact that no matter how hard we try sometimes, the outcome is negative, and to just simply remove the tooth solves the lingering problem. A third option is to do root end surgery to directly remove the lingering abcess in the bone around the root tip, and place a small seal filling into the tip of the root. 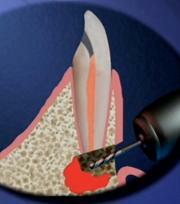 This usually also involves shaving a little bit of the end of the root flat so that the filling can be placed smoothly. This procedure is done by making a small incision through the gum lying over the end of the root and making a small window to get to the bone underneath. This procedure is quite useful when there is a persistent abcess in the bone despite the fact that the result of the RCT within the tooth looks good.